Outcome of GTR therapy is strongly dependent upon: (i) Bacterial infections, (ii) innate wound-healing potential, (iii) characteristics of the surgical site, and (iv) surgical techniques. The main disadvantage of expanded polytetrafluoroethylene (ePTFE) membrane is that it is non-resorbable and, therefore, should be removed in a second surgical procedure. Bunyaratavej and Wang  compared bioresorbable to non-resorbable membranes and concluded that using the ePTFE membranes resulted in more favorable bone formation compared to bioresorbable membrane. This resulted from the increased space available with ePTFE. However, due to the paucity of studies evaluating the regenerative potential of resorbable membranes alone, we aimed to find whether these resorbable membranes had an added benefit when compared to open flap debridement (OFD) alone. The study was designed as a controlled, randomized, parallel-arm study, comparing the clinical and radiographic outcomes of bioresorbable collagen membrane (Biocollagen ® ) withOFD versus OFD alone in the treatment of intrabony defects of patients. A total of 24 patients (12 males and 12 females) with age ranging from 25 to 35 yearsand witha mean range of 30 years were initially screened from the Out-patient Department of Periodontics, Oral medicine and Periodontology Department, Faculty of Dental Medicine, Al-Azhar University (Assuit branch) of these patients, four were diabetic, two were smokers, and two were non-compliant with the surgical procedure explained. Finally, 16 patients of both sexes (8 males and 8 females) satisfying the criteria of chronic periodontitis and each of whom displayed one intrabony defect were randomly assigned by a computer-generated randomization to two groups and were either treated with open flap surgery and Biocollagen (group 1) or with open flap surgery alone (group 2) in this parallel-arm study. Ethical clearance was obtained from the Institutional Ethics Committee of Faraby College, Research Unit ref (AEC 6-014). Group 2 (control group): OFD alone. Patients who satisfied the following selection criteria were enrolled in the study. No invasive periodontal therapy carried out in the past 6 months. All patients were explained about the study and written informed consent was obtained before the commencement of the study. After completion of the initial cause-related therapy comprising complete full-mouth scaling and root planing, proper oral hygiene instructions were given with an advice for tooth brushing for 3-5 min, two times daily, and the use of dental floss and or wooden tips for interdental cleaning. Open flap was performed in both groups: Group 1 [Figure 2] and group 2 [Figure 3]. [Figure 2] and [Figure 4], [Figure 5] and [Figure 6] depict the surgical procedures for group 1, while [Figure 3], [Figure 7] and [Figure 8] depict the surgical procedures for group 2. Following administration of local anesthesia, buccal and lingual mucoperiosteal flaps were raised. Following proper debridement of the intrabony defect, a bioresorbable collagen membrane of equine origin (Biocollagen; Bioteck: Stab Prod, Turin, Italy) was cut according to the morphology of the defect using a template. 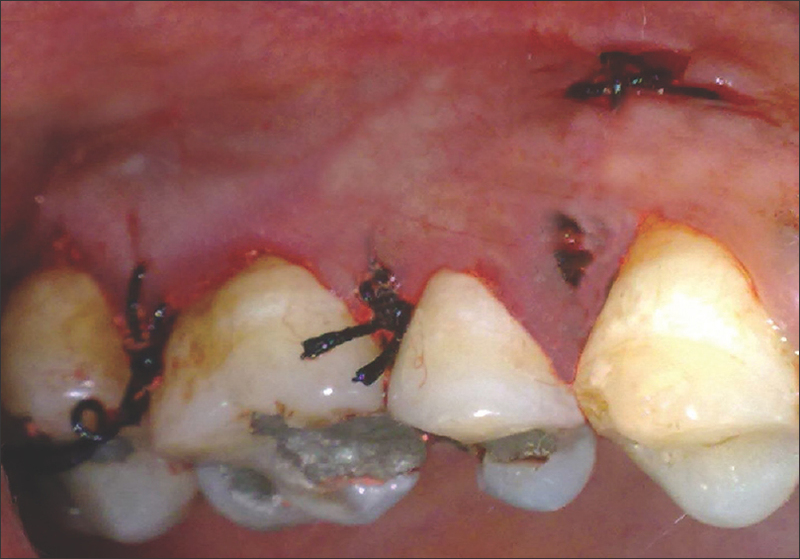 The material was applied with tweezers into the defect, such that the margins of the barrier were extended 3-5 mm beyond the defect onto the alveolar bone for stability. Sutures were not necessary as the defect morphology allowed a better adaptation of the membrane. The mucoperiosteal flaps were repositioned to cover the membrane completely. The flaps were sutured with 3-0 silk suture. Immediately after surgery, all the patients were prescribed 500 mg Amoxicillin every 6 h for 5 days, Ibuprofen 400 mg every 8 h, as needed, for pain, and 0.2% Chorhexidinegluconate twice daily for 4 weeks post-surgically to aid in plaque suppression. Patients were reviewed for symptoms such as discomfort, pain, and sensitivity, if any. Sutures were removed after 7 days. The patients were asked to refrain from mechanical plaque control at the surgical site for at least 4 weeks. Postoperative appointments were conducted at 7, 14 and 21 days. At 3, 6, 9 and 12 months post-surgically, both hard tissue and soft tissue measurements were taken. All data were transferred and stored in Microsoft Excel 2003 ® . Data analysis was performed using statistical test files. The calculations that were performed using the statistical program SPSS version 13 were: 1. Descriptive analysis: For comparison between the baseline reading and the subsequent readings; and 2. unpaired t-test for analysis within the same group. For comparison between the two groups, we used paired t-test. P < 0.05 were considered significant and < 0.01 as highly significant. Graphs were drawn using the Microsoft Excel 2003 program. The results showed no significance difference between both the groups in relation to changes in plaque and gingival indices. 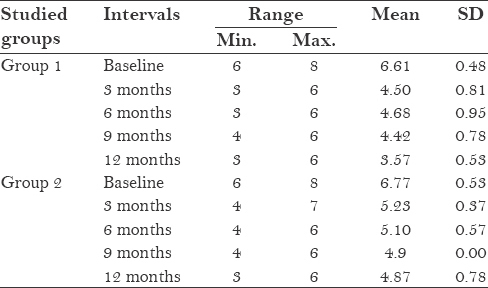 In relation to PD changes [Table 1] and [Table 2], [Figure 9], when group 1 was compared with group 2, there was a significant difference at 3, 6, and 9 months post-surgery and a moderately significant difference at 12 months post-surgery. 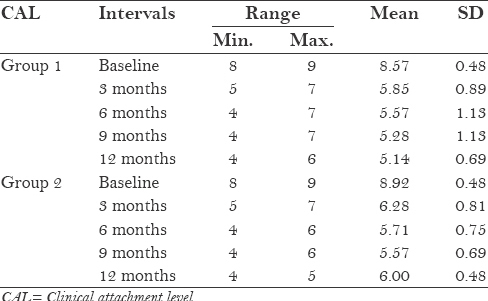 In relation to changes in the CAL or loss of attachment, as shown in [Table 3] and [Table 4], [Figure 10], when the first group was compared with the second group, there was a significant difference. 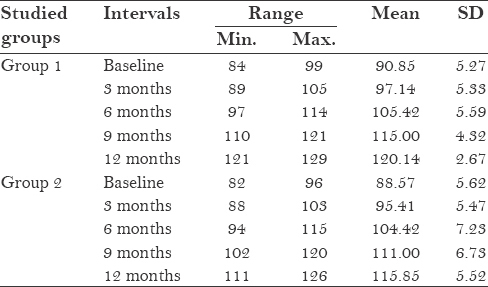 Finally, in relation to changes in bone density [Table 5] and [Table 6], [Figure 11], there was a significant difference when the first group was compared with the second group at 9 months post-surgery and a highly significant difference at 12 months post-surgery. Radiographic changes before and after treatment in group 1 are shown in [Figure 12] and [Figure 13], while the changes before and after treatment in group 2 are shown in [Figure 14] and [Figure 15]. Graphs were drawn using the Microsoft Excel 2003 program. 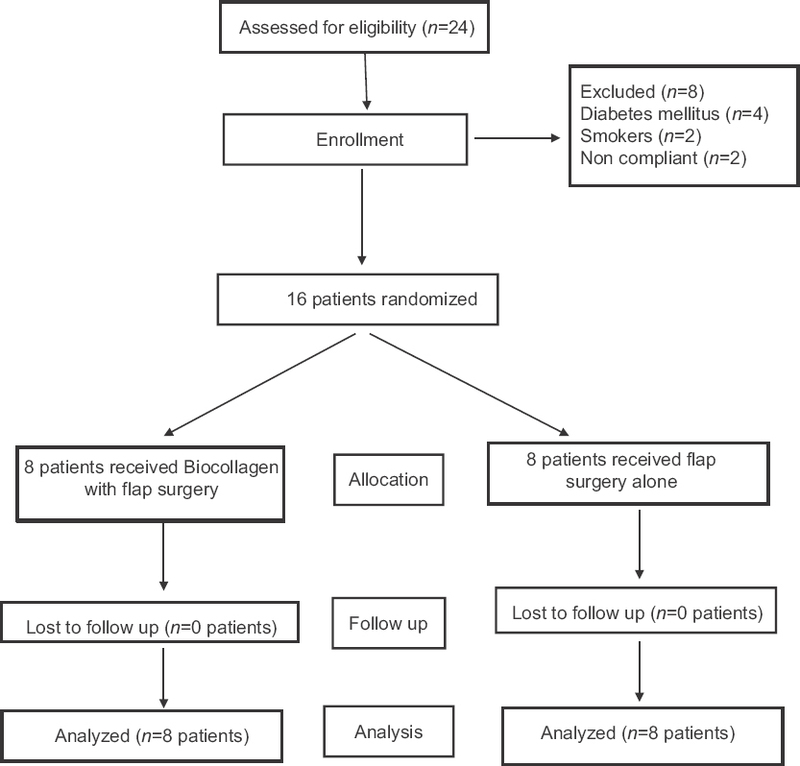 The present study aimed to evaluate the adjunctive benefit of the use of a biocollagen membrane in the management of intrabony defects both clinically and radiographically, compared to open flap surgery alone. 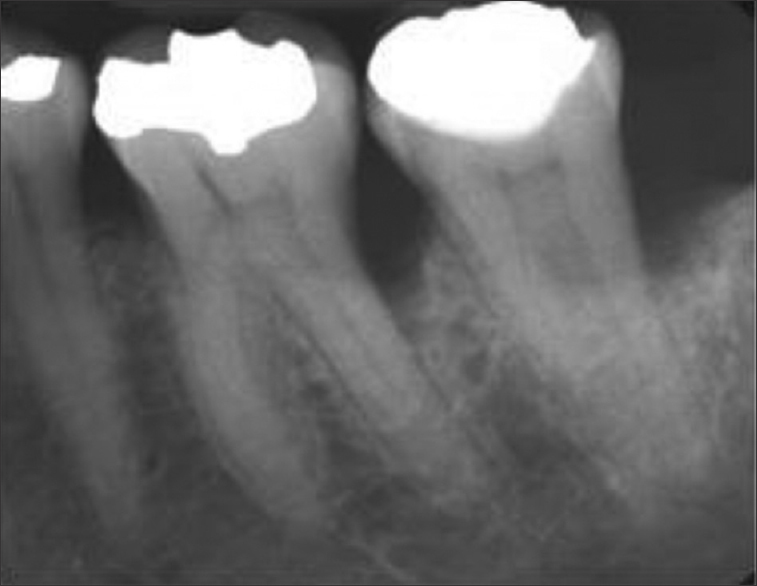 Literature states that reattachment is reunion of connective tissues and epithelium with the root surface on which viable periodontal tissue is found without formation of new cementum. 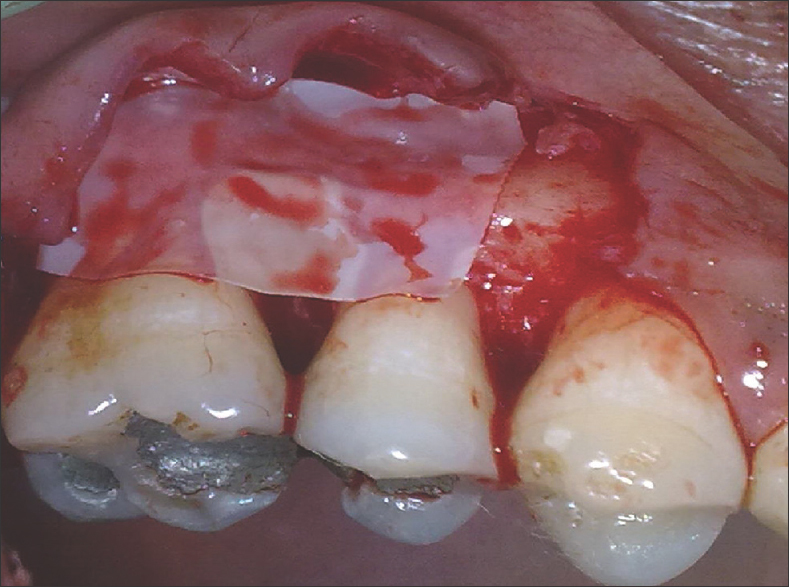 Whereas selective repopulation of root surfaces previously exposed to periodontal disease by periodontal ligament cells results in new connective tissue attachment, achieved by means of a biodegradable material interposed between the gingival tissue and the dental surface. Hence, we opted for a collagen membrane which helps in the selective repopulation of Periodontal Ligament (PDL) cells, keeping in view the regenerative potential of collagen in periodontal procedures. 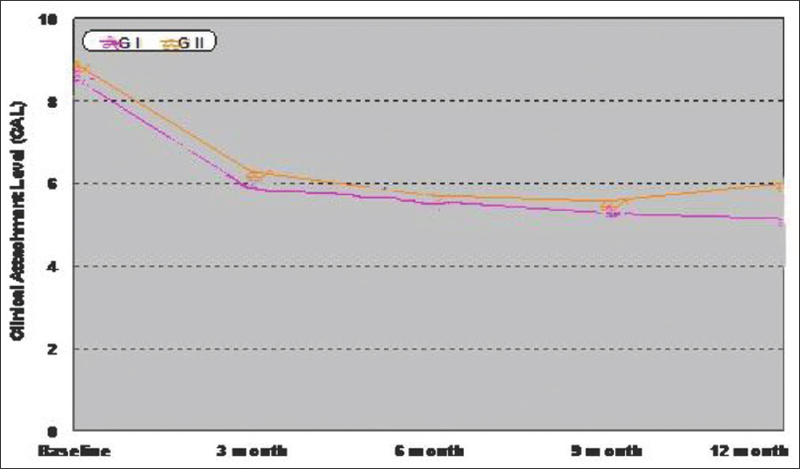 With regard to plaque and gingival index scores, the present study showed a significant reduction prior to surgery and this reduction remained throughout the observation period of these clinical trials, which could be attributed to the effective phase I therapy and patient cooperation. A similar finding was reported by Patrick et al. who concluded that good oral hygiene plays an important role in the management of intrabony defects before surgery. The main changes of plaque and gingival index scores that were recorded from the baseline up to 12 months indicated that the oral hygienic status of the patients who participated in the present work was good and that patient cooperation plays an important role in periodontal regeneration. These results are in accordance with the findings of Cobb  and Machtei et al. who concluded that adequate plaque control of the surgical site plays a major role in the healing of intrabony defects following the use of GTR. 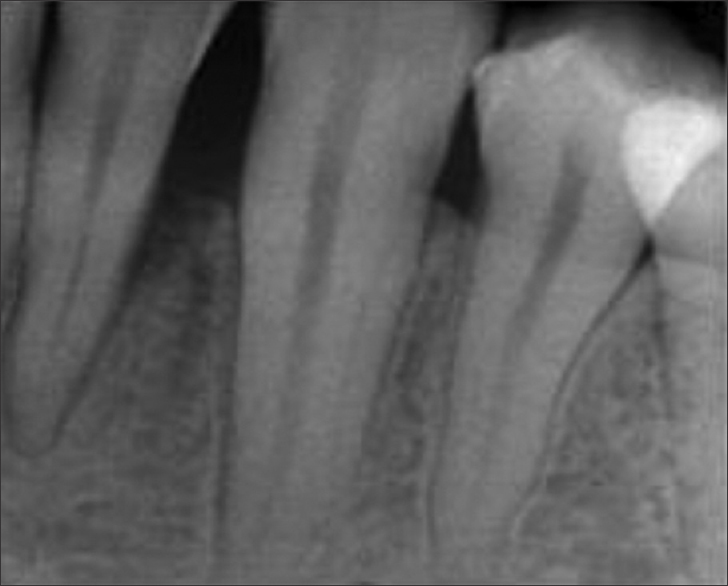 According to Loesche et al.,  decontamination of the root surface is essential for regeneration of the periodontal tissues. Our study substantiates this opinion with the finding that substantial improvement of the clinical symptoms after an effective cause-related therapy contributed to healing after periodontal surgery. The present study was also mainly designed to evaluate the efficacy of a Biocollagen membrane alone in the treatment of intrabony defects. The results showed that there was a statistically significant reduction in PD as well as gain of CAL and bone densities, as well as more bone fill in the group treated with Biocollagen. These findings are in accordance with the results obtained in a study by Joly et al. who had performed a similar study comparing GTR alone with an open flap surgery in the treatment of intrabony defects. Our results are also comparable with the findings of a similar study by Trejo et al.,  in had compared the regenerative potential obtained on using GTR in combination with demineralized freeze-dried bone allograft (DFDBA) to GTR alone in the treatment of human periodontal intraosseous defects and concluded that GTR had indeed shown regenerative outcome which overshadowed the additive benefit of DFDBA. The authors chose a 12-month period for evaluation in the present study; this is in accordance with the report of Rabelais et al. 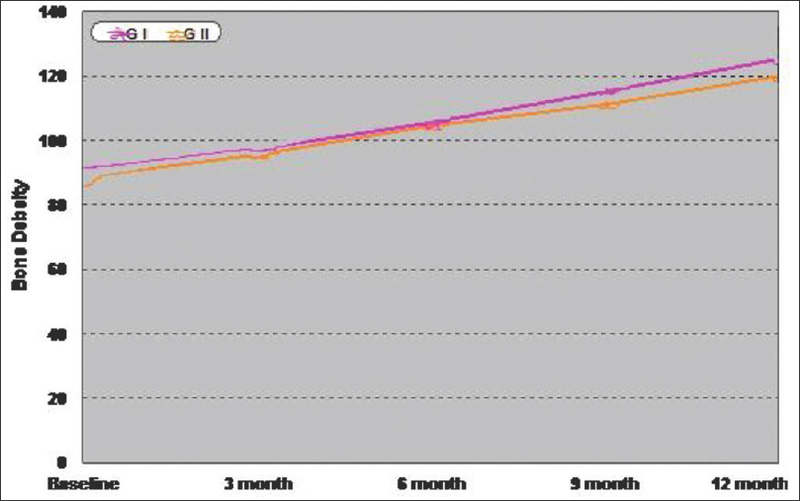 who concluded that a 6-month period was short and not enough to thoroughly evaluate the outcome of periodontal therapy with grafting technique. 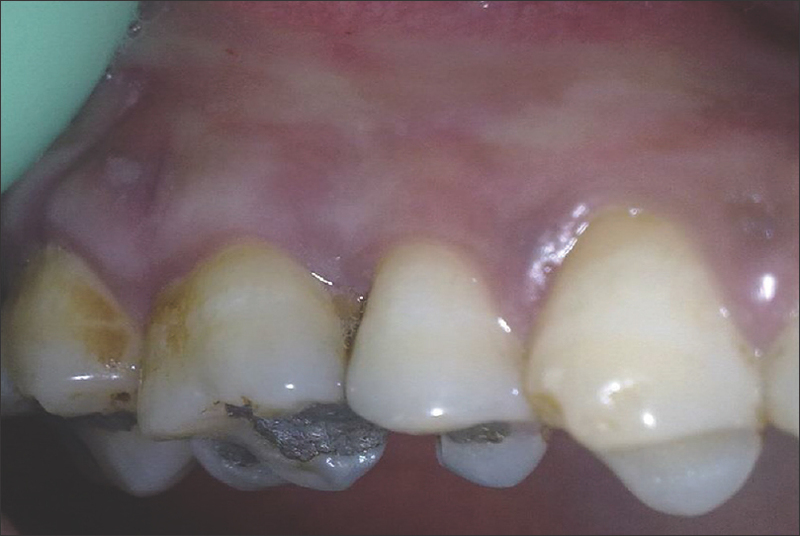 The success of periodontal regeneration is dependent on a multitude of factors such as patient's compliance with oral hygiene, smoking, defect depth, width, type of the barrier material used, recall maintenance, and an array of other factors. The decision to select the ideal material should indeed consider all the above-mentioned factors. Our choice to use a resorbable biocollagen membrane in the management of intrabony defects yielded positive results. So, within the limitations of the present study, the biocollagen membrane group showed a significant difference in reduction in PD and gain in CAL and mineral density, compared to open flap surgery group. Savage A, Eaton KA, Moles DR, Needleman I. A systematic review of definitions of periodontitis and methods that have been used to identify this disease. 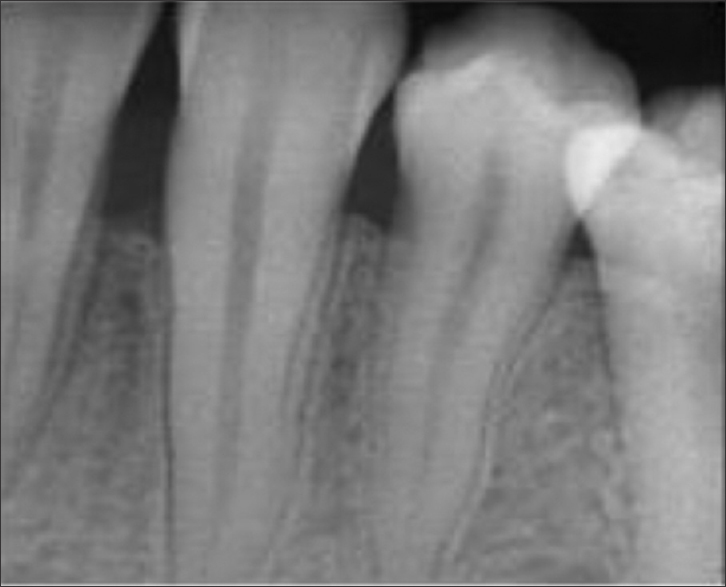 J Clin Periodontol 2009;36:458-67. Kaldahl WB, Kalkwarf KL, Patil KD, Molvar MP, Dyer JK. Long-term evaluation of periodontal therapy: II. Incidence of sites breaking down. J Periodontol 1996;67:103-8. Hirschfeld L, Wasserman B. A long-term survey of tooth loss in 600 treated periodontal patients. J Periodontol 1978;49:225-37. Albandar JM. Periodontal diseases in North America. Periodontol 2000 2002;29:31-69. Haffajee AD, Cugini MA, Dibart S, Smith C, Kent RL Jr, Socransky SS. The effect of SRP on the clinical and microbiological parameters of periodontal diseases. J Clin Periodontol 1997;24:324-34. Hancock EB. Regeneration procedures. In: Nevins M, Becker W, Korman K, editors. Proceedings of the World Workshop in Clinical Periodontics. Vol. 6. Chicago: American Academy Periodontology; 1989. p. 11. Magnusson I, Lindhe J. Current concepts in diagnosis and treatment of periodontitis. Semin Orthod 1996;2:13-20. Cortellini P, Tonetti MS. Clinical performance of a regenerative strategy for intrabony defects: Scientific evidence and clinical experience. J Periodontol 2005;76:341-50. Lynch SE. The role of growth factors in periodontal repair and regeneration. In: Polson AM, editor. Periodontal Regeneration: Current Status and Directions. St. Louis: Quintessence Publishing Co. Inc.; 1994. p. 179-98. Aukhil I, Pettersson E, Suggs C. Guided tissue regeneration. An experimental procedure in beagle dogs. J Periodontol 1986;57:727-34. Karring T, Lindhe J, Cortellini P. Regenerative periodontal therapy. In: Lindhe J, Lang NP, Karring T, editors. Clinical Periodontology and Implant Dentistry. Copenhagen: Munksgaard; 2007. p. 597-646. Egelberg J. Regeneration and repair of periodontal tissues. J Periodontol Res 1987;22:233-42. Karring T, Nyman S, Gottlow J, Laurell L. Development of the biological concept of guided tissue regeneration--animal and human studies. Periodontol 2000 1993;1:26-35. Araújo MG, Berglundh T, Lindhe J. GTR treatment of degree III Furcation defects with 2 different resorbable barriers. An experimental study in dogs. J Clin Periodontol 1998;25:253-9. Schüpbach P, Gaberthüel T, Lutz F, Guggenheim B. Periodontal repair or regeneration: Structures of different types of new attachment. J Periodontol Res 1993;28:281-93. 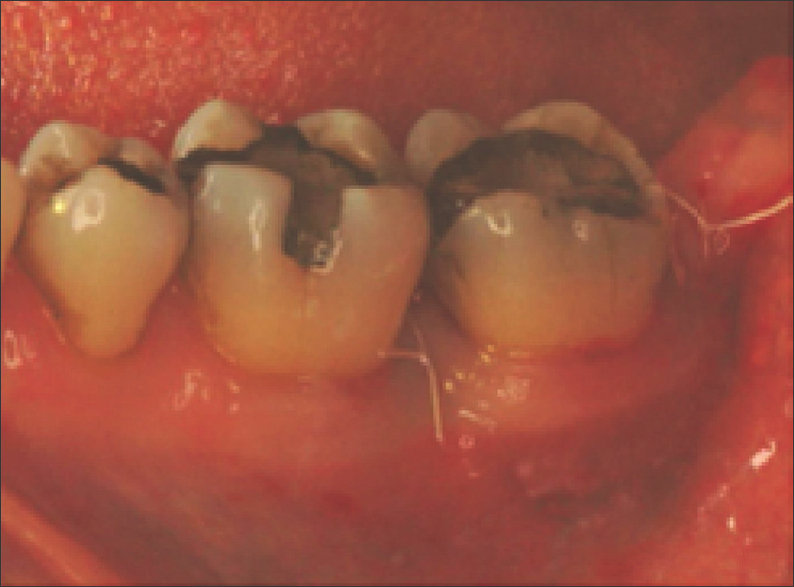 Graziani L, Laurell L, Tonetti M, Gottlow J, Berglundh T. Periodontal wound healing following GTR therapy of dehiscence-type defects in the monkey: Short-, medium-and long-term healing. J Clin Periodontol 2005;32:905-14. Nyman S, Lindhe J, Karring T, Rylander H. New attachment following surgical treatment of human periodontal disease. J Clin Periodontol 1982;9:290-6. 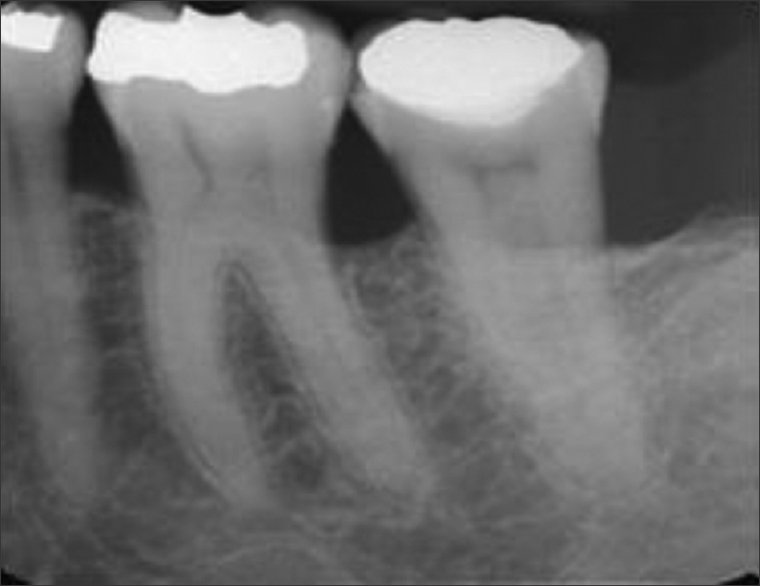 Garrett S. Periodontal regeneration around natural teeth. Ann Periodontol 1996;1:621-66. Eickholz P, Pretzl B, Holle R, Kim TS. Long-term results of guided tissue regeneration therapy with non-resorbable and bioabsorbable barriers. III. Class II furcations after 10 years. JPeriodontol2006;77:88-94. Karring T, Nyman S, Gottlow J, Laurell L, Hardwick R, Scantlebury T, et al. Development of the biological concept of guided tissue regeneration--animal and human studies. Periodontol 20001993;1:26-35. Hardwick R, Scantlebury T, Sanchez R, Whitley N, Ambruster J. Membrane design criteria for guided bone regeneration of the alveolar ridge. In: Buser D, Dahlin C, Schenk RK, editors. Guided Bone Regeneration in Implant Dentistry. Chicago: Quintessence; 1994. p. 101-36. Gottlow J. Guided tissue regeneration using bioresorbable and non-resorbable devices: Initial healing and long-term results. J Periodontol 1993;64(Suppl):1157-65. Kornman K, Robertson PB. Fundamental principles affecting the outcomes of therapy for osseous lesions. Periodontol 2000 2000;22:22-43. Bunyaratavej P, Wang HL. Collagen membranes: A review. J Periodontol 2001;72:215-29. Camelo M, Nevins ML, Lynch SE, Schenk RK, Simion M, Nevins M. Periodontal regeneration with an autogenous bone-Bio-Oss composite graft and a Bio-Gide membrane. Int J Periodontics Restorative Dent 2001;21:109-19. Scantlebury TV. 1982-1992: A decade of technology development for guided tissue regeneration. J Periodontol 1993;64(Suppl):1129-37. Adriaens PA, Adriaens LM. Effect of nonsurgical periodontal therapy on hard and soft tissues. Periodontol 2000 2004;36:121-45. Cobb CM. Non-surgical pocket therapy: Mechanical. Ann Periodontol 1996;1:443-90. Machtei EE, Dunford R, Grossi SG, Genco RJ. Cumulative of periodontal attachment loss. J Periodontal Res 1994;29:361-4. LoescheWJ, Grossman NS. Periodontal disease as a specific, albeit chronic, infection: Diagnosis and treatment. Clin Microbiol Rev 2001;14:727-52, table of contents. Fleicher HC, Mellonig JT, Brayer WK, Gray JL, Barnett JD. Scaling and root planing efficacy in multirooted teeth. J Periodontol 1989;60:402-9. Schmitt SM, Brown FH. 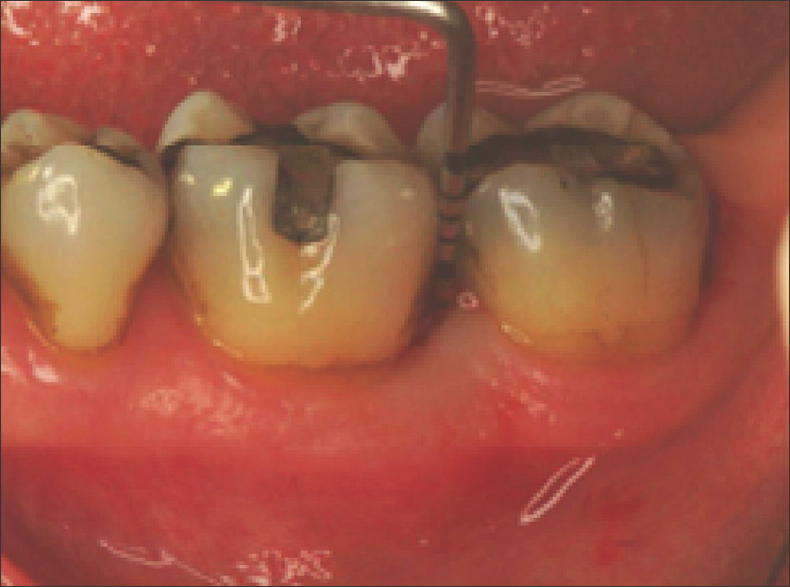 Management of root-amputated maxillary molar teeth: Periodontal and prosthetic considerations. J Prosthet Dent 1989;61:648-52. Kalkwarf KL, Kaldahl WB, Patil KD. 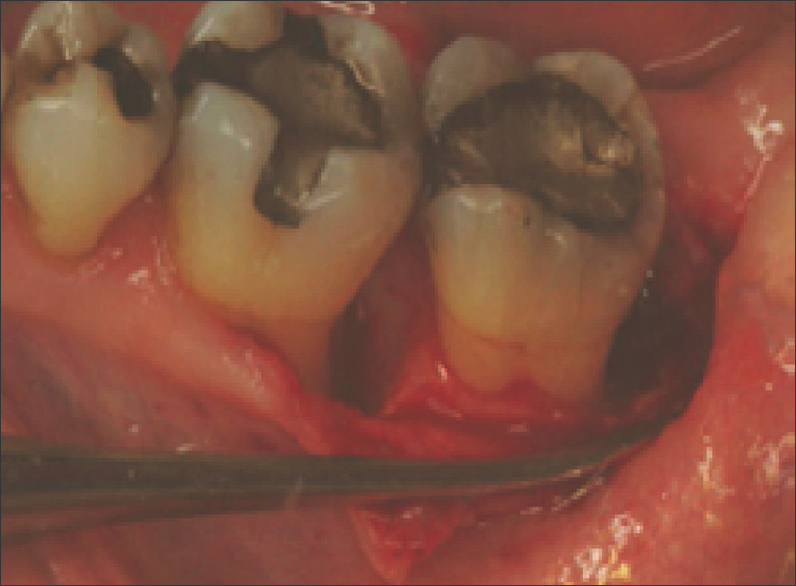 Evaluation of furcation region response to periodontal therapy. J Periodontol 1988;59:794-804. Lekovic V, Camargo PM, Weinlaender M, Nedic M, Aleksic Z, Kenney EB. A comparison between enamel matrix proteins used alone or in combination with bovine porous bone mineral in the treatment of intrabony periodontal defects in humans. J Periodontol 2000;71:1110-6. Joly JC, Palioto DB, de Lima AF, Mota LF, Caffesse R. Clinical and radiographic evaluation of periodontal intrabony defects treated with guided tissue regeneration. A pilot study. J Periodontol 2002;73:353-9. Trejo PM, Weltman R, Caffesse R. Treatment of intraosseous defects with bioabsorbable barriers alone or in combination with decalcified freeze-dried bone allograft: A randomized clinical trial. J Periodontol 2000;71:1852-61. Becker W, Becker BE, Berg L, Samsam C. Clinical and volumetric analysis of three-wall intrabony defects following open flap debridement. J Periodontol 1986;57:277-85. Reddy MS, Jeffcoat MK. Periodontal disease progression. Curr Opin Periodontol 1993;52-9. Rabalais ML Jr, Yukna RA, Mayer ET. 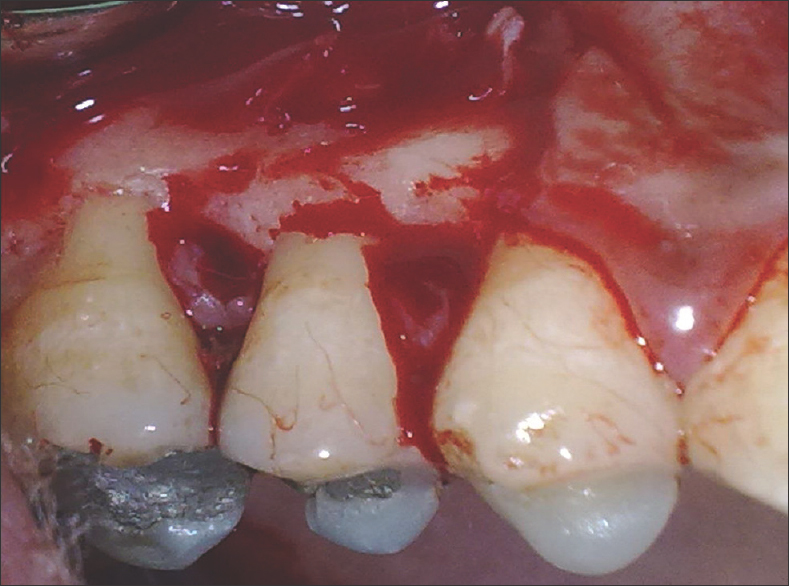 Evaluation of durapatite ceramic as an alloplastic implant in periodontal osseous defects. I. Initial six-month results. J Periodontol 1981;52:680-9.